Just yesterday I was reminded of how something less obvious on a census record; could be very important and very useful. I have been doing some research recently for a client whose ancestor was a James Park/Parks who was born 1835 in Tennessee. When I started the research; we had no idea of his parents or siblings. We knew he was on the 1870 census in Pettis Co., MO. In doing a small amount of searching; I had also found him on the 1860 census in Hickory Co., MO; which is near Pettis County. I knew this was him because I had previously found his wife in Hickory County; with her parents; on the 1850 census. When I initially found James Parks on the 1860 census; I immediately noticed that a William Parks was living just 2 households away from James. He was only a couple of years older than James; and had also been born in Tennessee. It didn’t take much for me to believe that he was “probably” a brother of James. I had spent a good bit of time searching for James Park/Parks/Parke in 1850. Of course I knew that he had been born in Tennessee. So…. I searched the entire U.S. for any James Park/Parke/Parkes who was born in Tennessee close to 1835. I found several. None of them really stood out to me; so I was not convinced that any of those I had found was the same James whom I was searching for. So… yesterday I was doing some more searching of the census records. In looking again at the 1860 Hickory County census above; and thinking about the Sarah J. Pruett who was in the household of James in 1860; I got to thinking about her. Her birthplace was also listed as Tennessee. I began to wonder if she might be related to James or his wife. At that point, I decided I should try to locate her on the 1850 census. “If” she was related; and “if” I could find her on the 1850 census; I might find James in the same county and state which she was living in at the time of the 1850 census. I did a search of the 1850 census for and Sarah Pruett/Prewitt, etc. ; who was born in Tennessee; and was the approximate age of this Sarah J. Pruett. I got several hits. I began to pay attention to the state and county in which each of these Sarah’s was living in; and one of them immediately jumped out at me. A Sarah J. Pruett was living right there in Hickory Co., MO in 1850. Her age was only 1 year off from the Sarah J. Pruett who was living with James Parks in 1860; and…. her birthplace was listed as Tennessee. Notice the last 3 people listed in that household. There was William “Parker”, who was 17 years old; James “Parker”, who was 15 years old; and John “Parker”, who was 13 years old! Remember….. the William Parks living by James in 1860 was 27. James was 25 at that time. A perfect match! 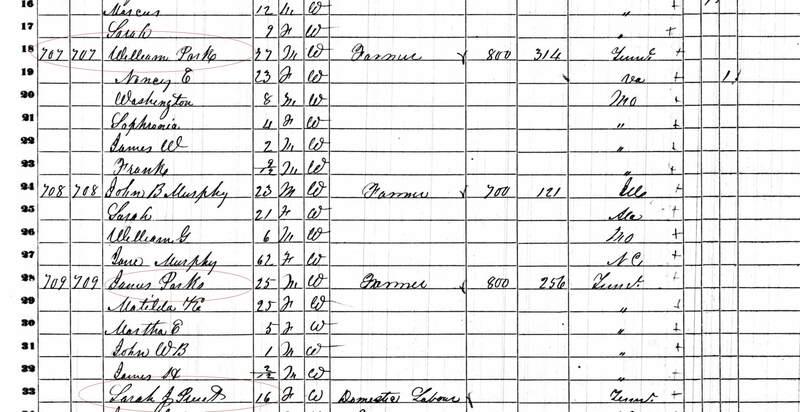 Thanks to my decision to search for Sarah J. Pruett on the 1850 census; I found James Parks (Parker). I also got some additional confirmation that the William living near him in 1860, was his brother. And…. I got some additional information and clues. I gained the name of John as another brother of James. Finally; based on the ages of all of the children in the Pruett household in 1850; and the age of Robert Pruett’s wife, Elender; it seems likely that Elender was probably the second wife of Robert; and that the “Parker” children were probably hers from a previous marriage. Notice that there is an 8 year gap between Matilda (18 years old) and Eliza J. (10 years old). Although more research needs to be done to confirm; it seems likely that Matilda and her older brother, Aaron; probably belong to Robert and a previous wife. The Park (Parker) children likely belonged to Elender and a previous husband. Eliza J., Sarah J., Margaret E. and Nancy E. probably belong to Robert and Elender together. In other words; I “think” I have also found the mother of James Parks. Sarah J. Pruett was likely the half sister of James, William and John. This would explain why she is living with James in 1860. Of course there is more research to be done. But; I now have some great additional clues and information to work with; all thanks to Sarah J. Pruett! I have just begun research for a new Client; and was quickly reminded of the importance of paying close attention to census records. My research for this client, is to try to find the parents of Almer Manor; who was born about 1835, in Tennessee. He first appears on the 1860 census of Johnson Co., IL; with his new wife; Sarah; whom he had recently married. Although this client has searched for many years; she has never really found any clues as to his parents. As usual, the first thing I started doing; was to locate Almer in the census records; beginning with the 1860 Johnson Co., IL census; and transcribing his family in the census records. Almer is the only Manor in Johnson County in 1860. He and his wife married there in 1859. I have not been able to find Almer on an 1850 census in Tennessee or Illinois. Since Almer was the only Manor in Johnson County in 1860; I decided to check for any Manor’s who might have been in Johnson County in 1850. No luck. None there. So…. I decide to move on in locating Almer and family in the census records after 1860. By 1870, Almer and family family begin appearing on the census records in nearby Jackson County, Illinois. He was in Kincaid Township. Once again; I search the entire County for any other Manor’s who might appear there. There was one other Manor household in the County. This household was headed by a David Manor; who was born about 1833, in Tennessee! And… it just so happens that David is in Bradley Township; which borders Kincaid Township! So… We now have this David Manor; who is living in a bordering township to Almer; who was born in the same State as Almer; only a couple of years earlier than Almer. And… his is the only other Manor household in the County. To make David even more interesting; is the fact that I find a couple of his children buried in the same cemetery as some of Almer’s family. Although I cannot say for certain; without further investigation; it is likely that this cemetery was near the township borders of Kincaid and Bradley; and that Almer and David did not live all that far from one another. Based on this new information; I have likely found a brother of Almer. This means I now have a new route I can take in trying to find Almer’s parents. In other words; if we can’t find Almer’s parents; we can search for the parents of David. If found; we will likely be finding the parents of Almer as well; since they were likely brothers. Having found this David in 1870; I knew I needed to search for him in earlier census records as well; looking for other clues. According to the 1870 census, David was born about 1833, in Tennessee. His wife, Christine, was born about 1831; also in Tennessee. They had a 10 year old child, who was born in Missouri; an 8 year old, born in Missouri, a 6 year old, born in Missouri, and a couple of younger children, born in Illinois. Based on this information, I knew David should appear somewhere in Missouri in 1860. It didn’t take me long to locate David and family on the 1860 census of Oregon County, Missouri. The 1860 Missouri census, of David’s household, reveled even more clues. Bennett; who was the oldest child of David, per the 1870 census; was in fact, not the first child. In 1860, David and his wife have a 3 year old daughter, Elisabeth. Elisabeth provided another clue. She was 3 years old; but was born in Tennessee. Because David, his wife, and their first child were all born in Tennessee; I now know that it is likely that David and his wife married in Tennessee. This would seem to indicate that Almer and David’s parents probably did not come to Illinois. After all, David remained in Tennessee until after he was married. That 1860 census of David, provided yet another good clue. Living with David and his wife, was a Porter Manor, who was 22 years old (born about 1828). Once again; it is likely I have found another brother of Almer. We now know that it is likely Almer had brothers David and Porter. We also know that it is not likely that their parents brought the family to Missouri or Illinois. With this new found information; I now have more ways of finding Almer’s parents. Since Almer seems to appear in Illinois by himself; sometime prior to 1859; it would have been very difficult to find his parents, without knowing where in Tennessee he had come from. However; I now have some options. 1. I will do a thorough search of the 1850 census in Tennessee; in hopes of finding a household that includes Almer, David and Porter. If I can find such a household; I will likely have found the parents. 2. I can search for a marriage for David and his wife, in Tennessee. If I can find their marriage; I will know what County to search for the parents in. 3. Since a death certificate has never been found for Almer; I can search for a death certificate of David; or even of his wife. Their death certificates should name their parents. Even if I cannot locate a death certificate for David; I have already found his wife in the death index; and can obtain her death certificate. Finding her parents; and knowing what County they were in about the time David and she married; will give me a place to also search for Almer, David and Porter’s parents. The lesson in the above is not to have “Tunnel Vision” when searching for our ancestors. In other words; don’t focus solely on your known ancestor. If searching records of that ancestor get you no where; look for possible siblings. Those potential siblings can lead you to the same place your are trying to get to. There’s always more than one road to our destination. If you run into a dead end on one road; search for another road, and follow it. Especially when dealing with a surname that is not so common; always be sure to check the County which your ancestor is in, for others of the same surname. Pay attention to their approximate birth places and years. These can tell you if they were in the same States as your ancestors; and if they were there at the same approximate times. I truly hope this experience helps someone else, in the search for their ancestors. A few days after I created this blog; just about 3 weeks ago; I wrote about a great find I had made; all because of clues from a census record. This morning; I made another great find; that started all because of a clue in an 1880 census record. The subject here was a woman by the name of Minerva Lichty (also found as Lighty). We knew that she was the mother of Roscoe Spotts; who was born in Wayne Co., IN, in 1887. Roscoe was found in the household of his father, Charles Spotts/Spatz, on the 1900 census of Wayne Co., IN. Charles was a widower by that time. Charles’s mother, Adeline; and a couple of sisters of Charles, were living with him. There is little doubt that Adeline and the sisters of Charles must have played a very large part in raising Roscoe. Charles “Spatz” had married Minerva Lichty, in Wayne County, IN; 14 Dec. 1886. Since Roscoe was born in 1887, he was no doubt the first child. Roscoe was 12 years old at the time of the 1900 census; and was the only child in the household. So… one must wonder if Minerva had died soon after the birth of Roscoe; he apparently having been the only child. In attempting to locate the parents of Minerva; I first searched the 1880 Wayne County census. Minerva Lichty was found in the household of Ephraim and Eliza Wolfgang. She was 15 years old; and was listed as a “niece”. This was the first clue. Because she was listed as a niece of Ephraim; I knew that either Ephraim was a brother to Minerva’s mother; or; his wife Eliza, was a sister of Minerva’s father. Since I now knew that Minerva must have been born about 1865; I moved on to the 1870 census; expecting to find Minerva with her parents; and knowing she would be about 5 years old. The search was not going well. I could not find a Minerva Lichty/Lighty on the 1870 census of Wayne County. After spending some time, trying various spellings; trying all of the tricks I know; and still unable to find her; I finally decided to try searching for her only by her first name and her approximate birth year. So…. I put “Manerva” in the first name field; and nothing in the field for the last name. I put “1865” in for the birth; with a plus or minus of 5 years. None of those results matched. I then tried again, using “Minerva”. Again; I did not put a last name. I did put the birth year of 1865 (plus or minus 5 years) and “Wayne County, Indiana” in the place field. To my surprise, I found a Minerva in the household of Ephraim Wolfgang. She was 6 years old. Apparently, the census taker must have assumed Minerva’s last name was also Wolfgang. Of course I already knew that was not the case. But…. I had found her. I knew this family had lived in near or in the town of Cambridge City, IN (Wayne County); and also knew that worldvitalrecords.com (A subscription based site) had some old Cambridge City newspapers on their website. Since I knew there wouldn’t be many Wolfgang’s listed; I decided to search those Cambridge City newspapers for Wolfgang. I found the obituary of “Susan” Wolfgang; who was the wife of Ephraim. Of course the 1880 census gave her name as Eliza. But…. that wasn’t really an issue. Eliza may have been her middle name. At any rate, the obituary of Susan Wolfgang; stated that she was the wife of Ephraim Wolfgang. But… it did a lot more than that. It also provided me with her maiden name; which was “Lighty”; and gave her parents names. Since I now knew that the “Eliza” Wolfgang whom Minerva was living with in 1870 and 1880 was a apparently a sister of Minerva’s mother; and then knew to look at the household of Susan (Eliza’s) father in earlier census records. I was then able to easily find Susan’s parents on the 1850 Wayne County census. Long story short; this census shows that Susan had 5 brothers. They were John, Daniel, Henry, James and George. So…. this puzzle isn’t completely solved. However; I now know that George Lichty/Lighty (mother of Susan and the boys I just mentioned) was the grandfather of Minerva; and that one of his son’s was apparently the father of Minerva. So… the search for Minerva’s parents has certainly been narrowed down. And… all because I found her listed as a “niece” on that 1880 census; in the household of Ephraim and Eliza Wolfgang. I cannot emphasize how important it is to carefully read and analyze all of the information on those census records. They often times hold great clues. It’s not just the names and dates were want to look at. I was thinking yesterday about a recent find I made in the census records, when researching a couple of months ago for a client. So…. thought I would write a little about it. Make no mistake about it. I would have never found this fellow in the 1880 census; without some very creative searching. This fellows name was Richard Guest or Guess. I had him and his family on the 1860 and 1870 census. I also had his widow living with a son and a couple of daughters in 1900. I knew, based on the 1900 census, that Richard had not died until sometime after 1890,; when the youngest daughter was born. In 1860, 1870 and 1900, the family was always found in Nashville, Davidson Co., TN. I had tried everything in order to find this family in the 1880 census. I knew they should have been there in Davidson Co.; but just could not find them. I tried searching the children’s names. Tried searching the Wife’s name. Tried the various spelling of the last name. I probably spent 2 or 3 hours trying to locate the family in 1880. I was getting very frustrated! After thinking on this for a while; a thought came to me. In 1860 and 1870, Richard’s occupation was listed as that of a “Fisherman”. I thought….. How many fisherman could there be in Davidson County in 1880? Surely there could not be more than a few. So… back to the 1880 ancestry census records I went. I go to the 1880 census search. I put absolutely nothing in for first of last name. I enter “Davidson County, Tennessee” into the “Lived In” field of the search page. Then; I put “fisherman” in the “occupation” field of the search page. There were 33 matches that came up. I browsed through those 33 matches, and found 2 of these men whose first name was Richard. There was a Richard Copeland; and a Richard Johnson. I looked at both families. The wife and children of Richard Johnson did not match that of my client’s Richard Guest. However; Richard Copeland’s wife and children were a perfect match! I was sure I had found the right man. I began searching some Davidson County marriage and death records; trying to locate records of the children of Richard. Interestingly enough; I found the death certificate of his son, Albert. His death certificate listed his name as Albert “Copeland” Guest! Although Copeland had been entered on the death certificate, where the middle name was meant to be; it still confirmed that the Richard Copeland and family; which I had found on that 1880 census; was the right family. Later; I found a couple of marriage records of the daughters of Richard. Although the widow of Richard; and his children, were listed with the last name of “Guess” on the 1900 census; a couple of those daughter who married right before and right after 1900; had married under the last name of Copeland. Ironically; in spending so much time to finally answer the question of where Richard and family were in 1880; I had also created a new question; that I am not sure will ever be answered. Why was Richard’s last name Copeland in 1880. The 1860, 1870 and 1900 census records all list the family as Guess/Guest. However; the 1880 census lists the last name as Copeland. The death certificate of a son, listed his name as Albert Copeland Guest. Also; I had found marriage records of a couple of the daughters; which listed their maiden name as Copeland. Looks like I answered one question; and created some new questions by doing so!